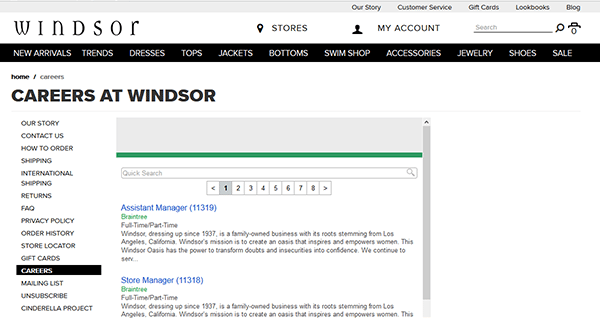 The Windsor job application can be accessed on the company’s main employment/careers page (via the links provided on this page). Several different career types can be searched/applied for online, however the guide posted below details how to search/apply for retail positions. Follow the step-by-step instructions to learn how to search for current openings, create an online profile, and submit an application. About the Company: Windsor is a department store that specializes in women’s clothing/fashion/accessories. The company was founded in 1937, and operates numerous locations throughout the United States. Step 1 – Use the link posted below to open the Windsor careers page in a separate browser tab/window. Note: You can also click here to load the page in another window/tab. Step 2 – Scroll down the page to view all of the results. The list of job openings can be sorted/filtered by entering a keyword (e.g. location, job title, etc.). Step 3 – When you’ve found a position that interests you, click its link/title to go to the next step of the process. Step 4 – Read the job summary and then press the button as shown in the below screenshot (outlined in red). Step 5 – Click the “Create Account” button. Step 7 – After your account has been registered you will be transferred to the main application form.